If there is anything that I find exciting … Definitely any form of a surprise! Whether big or small, surprises are fun and pleasurable but still engage in some form of secrecy and mystery, becoming even more interesting. Although I do enjoy being surprised now and then, surprising others is one of my favourite things to do, as it allows my creative juices to flow and my originality to blossom. Being very sentimental, I appreciate anything that has been done through time, effort and thought, and in turn, I attempt to do the exact same for others. 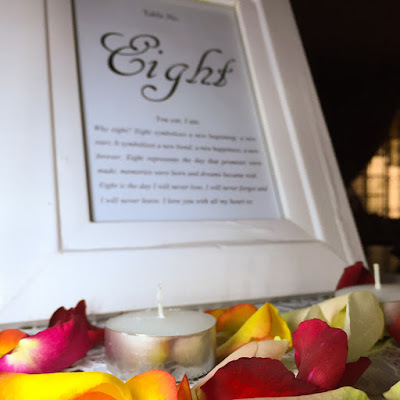 Rather than grabbing the first thing you see in a store, believing it to be the ‘most appropriate’ gift for the occasion, why not create such a gift (or in this case, the actual occasion) yourself? Best part? 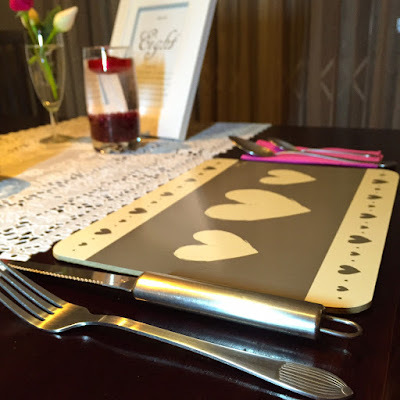 It is inexpensive, you can plan and do it to suit yourself and the occasion, all in the comfort of your own home. Chic but with good technique! 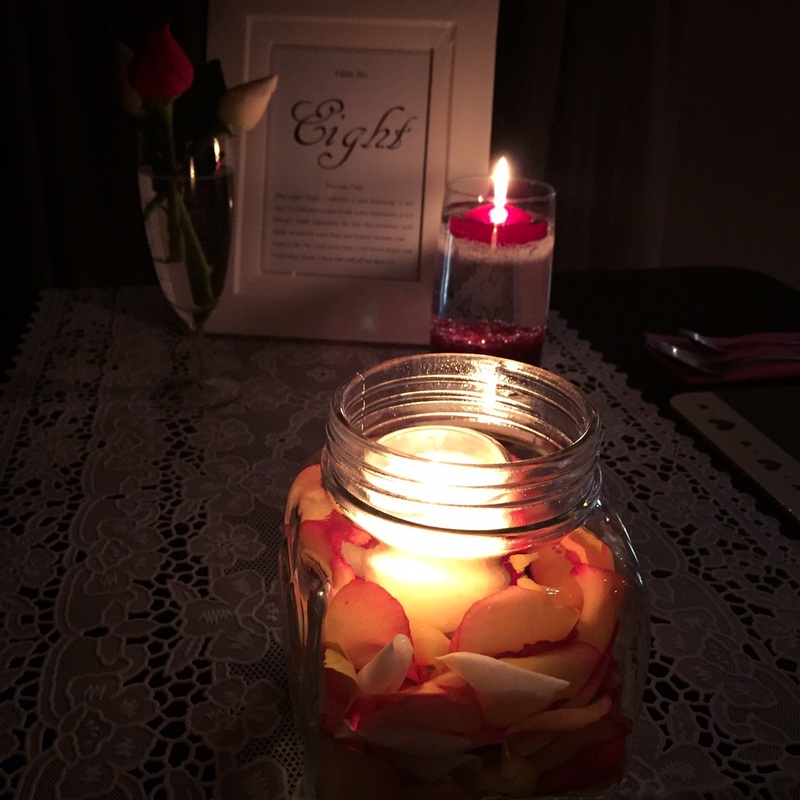 Candles bring a whole new dimension to any situation. They set an ambiance that is both calm and romantic but also beautiful. 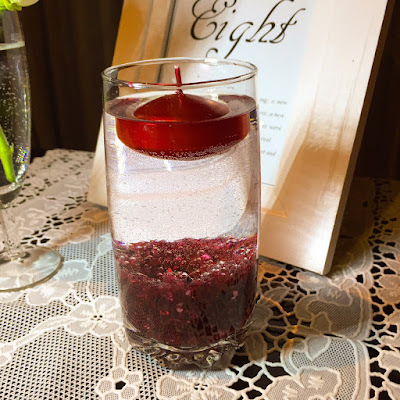 One of the simplest ideas to start off with is placing a tealight candle on the base of a champagne (or even wine) glass. This looks elegant and can be used as simple candle holders. Different dimensions can be created by using glasses of different sizes and heights. Place small stones, chippings or any other ambiance décor at the bottom of an average drinking glass. 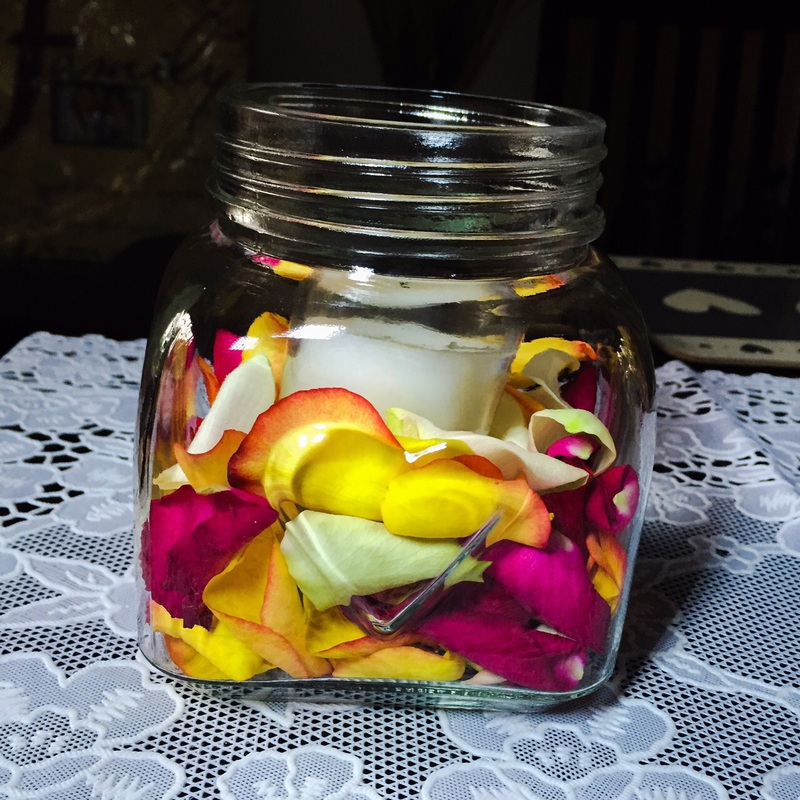 Fill with water and top with a floating candle. It looks absolutely gorgeous when lit! Taking a flat, square mason jar with a heart design on its front, I placed several different coloured (fresh) rose petals in it, placing a small candle in its candle holder in the centre of the jar. Rose petals of the same colour may be used, however I chose these as it breaks the one-colour-only monotony. Artificial petals may also be used. NOTE: Make sure that the petals are BENEATH the candle and that the candle is in a holder. You don’t want to start a fire on your date! 4. 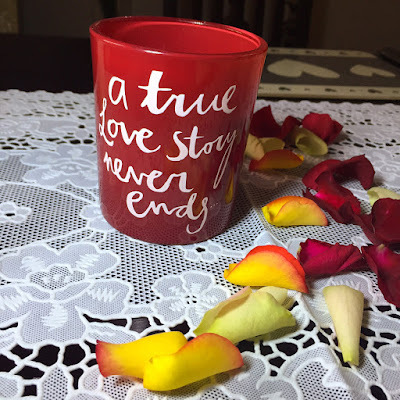 I also added in this Mr Price Home glass wax fill candle, quoting “A true love story never ends”. With its berry scent, I thought it was super cute and appropriate for a romantic date, also giving a fun of touch to the décor. I used these grey and white heart-decorated placemats. 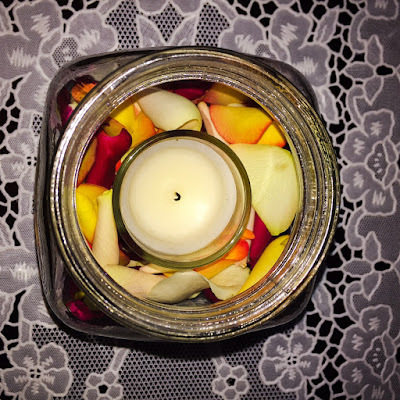 I opted not to use red and white ones simply because, once again, I wanted to add some colour and excitement to the table while still keeping it sophisticated and simple. 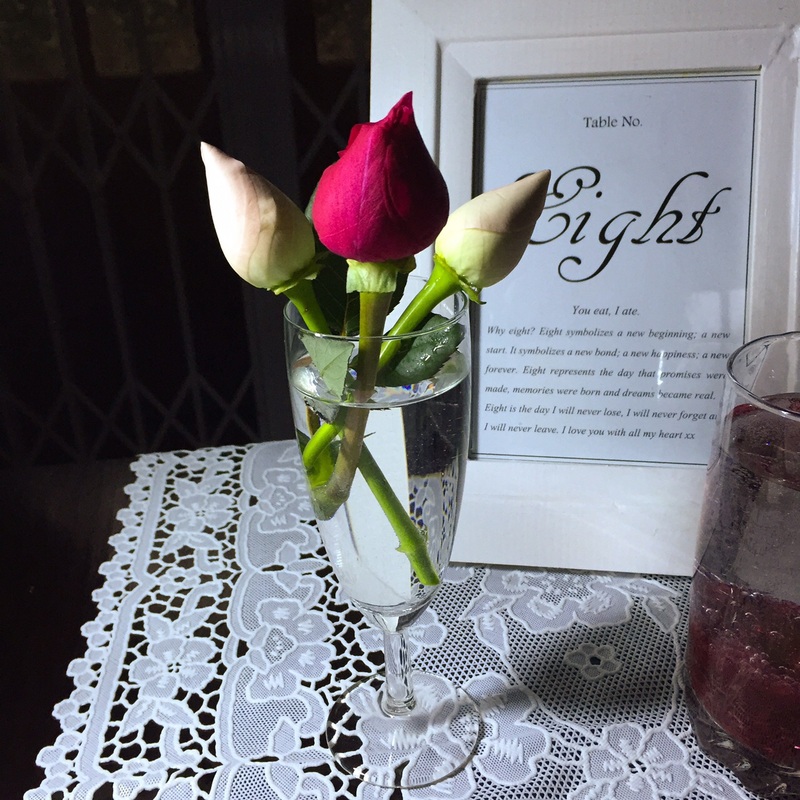 I also used a wonderful lace-plastic table runner, allowing its beautiful design to contrast again the centre of the dark table. 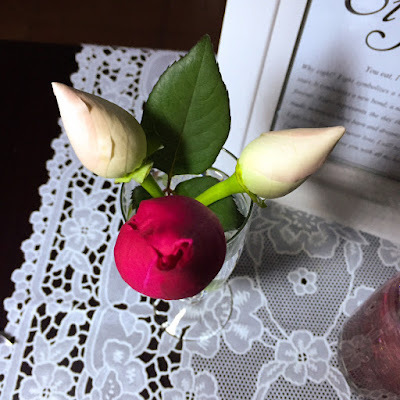 Since I picked the rose petals myself from a bouquet of roses, I discontinued the picking once I came roughly to the point below, in which I thought the flowers looked lovely. I placed these in a champagne glass filled with water. 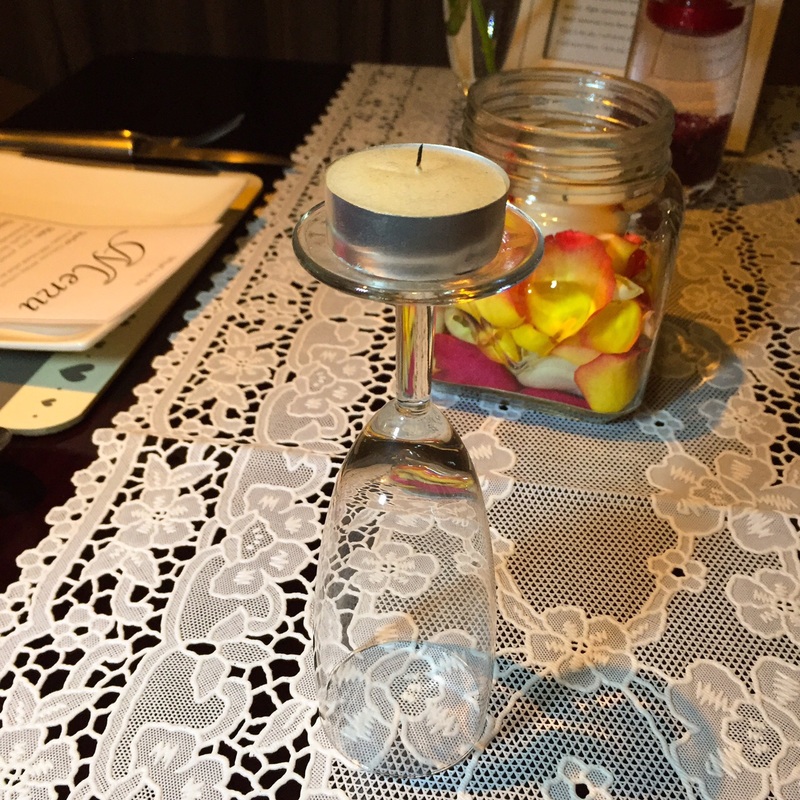 I thought this to be a beautiful centre piece for the table. 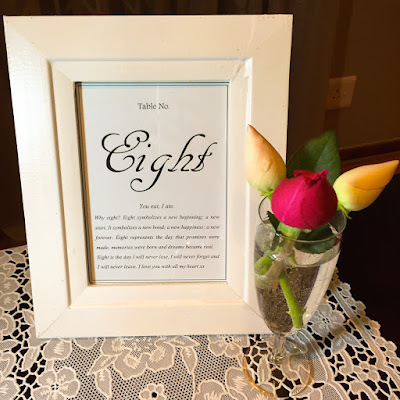 Becoming a little more personal but yet still keeping with the 3-course-meal-in-a-higher-order-restaurant theme, I decided to create a table number. I chose a number that was common and significant to both myself and my significant other, followed by a short love declaration. I printed this and placed it in a plain white frame. This idea creates your own uniqueness and touch to the occasion and was extremely successful. I then also decided to create my own personal menu, placed on a small side plate filled with rose petals. This idea was another one that was extremely successful. Not only does it give your partner a restaurant-feel, it will also provide you with some guideline and planning of the evening’s meals. A mix of white & milk chocolate mousse in Mr Price Home’s adorable heart ramekins topped with some grated Peppermint CrispChocolate served with homemade fresh cream. 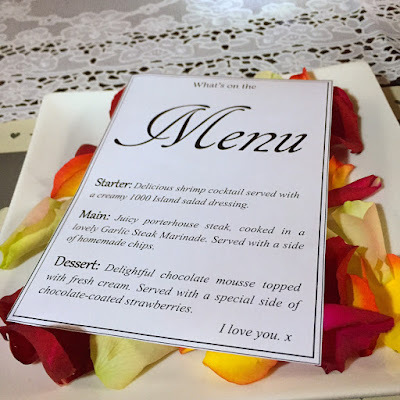 This was served with a side of white chocolate-coated strawberries (my absolute favourite! ), also served in Mr Price Home’s textured dipping bowls. I hope that you enjoyed my very first post. Be creative, and manipulate the theme and food to suit yourself and your guest(s). Remember that this can apply to a couple, best friends or even a girls’ night in! Leave comments below, show me what you have created and have fun in doing so. 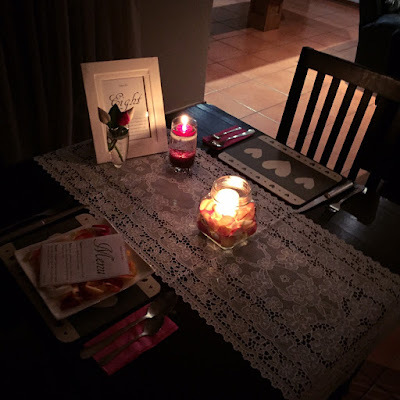 Great post, a nice way to put on a romantic dinner.